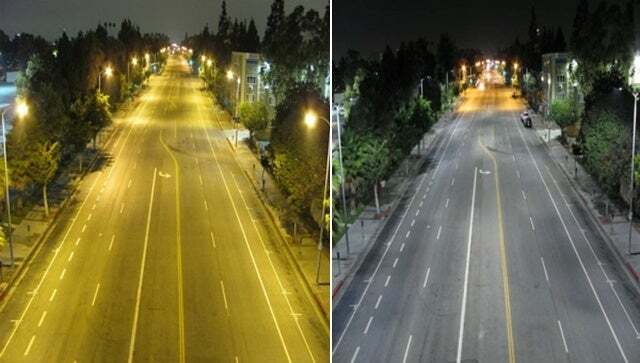 Before and after Los Angeles replaced their high-pressure sodium streetlights with LEDs. © COPYRIGHT 2015 CITY OF LOS ANGELES. ALL RIGHTS RESERVED. LEDs aren’t just for student science projects anymore. Out on our city streets, LED streetlights are an emerging technology that use significantly less energy, offer improved light quality, and last longer. On an apples-to-apples, technology-to-technology comparison, LED streetlights easily beat out all the other streetlighting technologies. No wonder, then, that cities nationwide are beginning to replace their streetlights with LEDs. However, many cities are missing out on the real opportunity with LED streetlights: smart controls and the potential for a networked city.